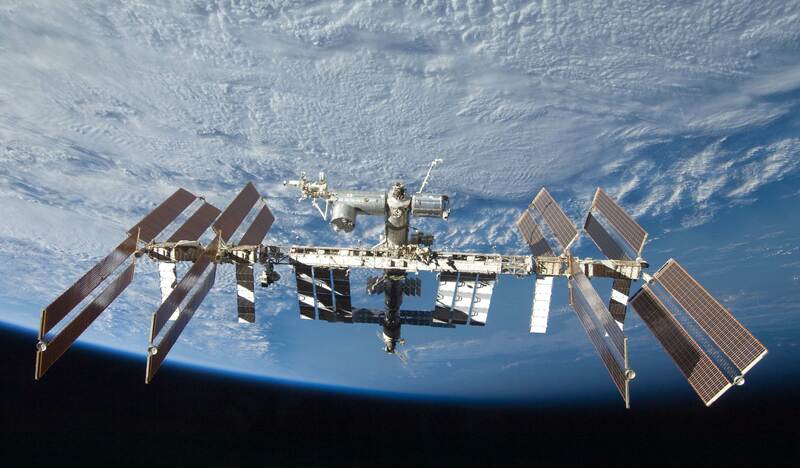 The International Space Station has been in the news today due to a (probably false) ammonia leak. As a former flight controller, just thinking about an ammonia leak in the ISS gave me an adrenaline rush. What does this mean, and why is it such a serious situation for the astronauts aboard the orbiting laboratory? Read on! You can also follow along with the action as if you were sitting in Mission Control. The Tietronix website ISS Live! streams real data from the International Space Station. Open it up in a separate tab, then keep reading – I’ll talk you through the signs of today’s action. Once it’s open, click on “Live Data.” This page shows you the crew’s schedule and tells you a bit about what the astronauts are doing at any given moment. Of course, their schedules are completely messed up on a day like today! Next, click on “Console Displays.” This brings up a spreadsheet-looking page with a bunch of crazy acronyms on it. Each of those acronyms is the call sign of a flight controller in Mission Control! You can spend a lot of time clicking around, learning about the different disciplines (most of the pages even have short PDF documents that explain the job of that flight controller in a bit more detail – and they’re written in plain English, not engineer-ese)! 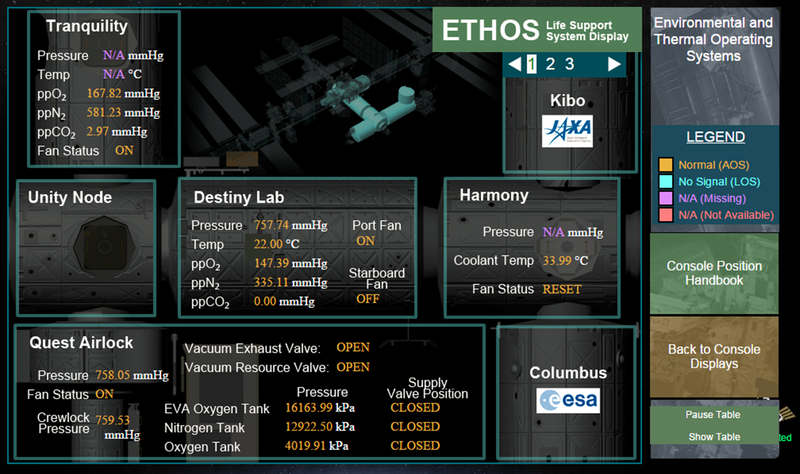 But for today, click on ETHOS: the flight controller who monitors the air, water, and cooling systems inside the ISS. You’re now looking at a small subset of the data an actual ETHOS flight controller sees when they are sitting in the Mission Control Center. The data is laid out in a pattern similar to what the space station looks like if viewed from above (compare to the picture of the station below). In the center is the “Destiny Lab,” which is where a lot of the science is conducted on ISS. You’ll see the pressure in the station, temperature, composition of the air (partial pressure of oxygen, nitrogen, and carbon dioxide), as well as whether the fans in the Lab are running. Similar information is given for the other core modules (which I can go into later, if you ask via a comment). The ammonia on the ISS is part of the “External Thermal Control System”: NASA lingo for pipes filled with cold ammonia that take heat from inside the space station and move it outside, to two huge radiators which then cast off that heat into space. It’s something like the antifreeze in your car, which takes the heat from your engine and gets rid of it through your radiator. See the big, silver, rectangular panels sticking out the back of the space station in the photo below? Those are the radiators with ammonia flowing through them. Of course, ammonia is extremely poisonous to humans. Why would the Station use such a dangerous chemical for heat transport? It’s really good at it! It also doesn’t freeze at the extremely cold temperatures outside the Station. The engineers who designed the ISS knew that it could be dangerous and went to extraordinary lengths to make the space station safe, but there’s always the (very, very small) possibility that the cooling system will leak and ammonia will enter the living area of the Space Station. The astronauts are trained to respond immediately to the slightest sign of a leak. They drop what they are doing and get to the Russian Segment of the Space Station as fast as they can! An ETHOS flight controller in Mission Control looks for a couple of different things when watching for an ammonia leak. As a NASA press release said this morning, one of the signs is a cabin pressure increase from the ammonia entering the air. You can keep an eye out for this, too, by checking the Pressure in the Destiny Lab and the Quest Airlock! The Russian-built modules of the ISS do not use ammonia coolant. By sealing themselves into that part of the ISS, the astronauts are then safe from exposure to ammonia. That’s what the crew did this morning when the signs of an ammonia leak started. While it’s starting to look like this was a false leak (perhaps a sensor gone bad inside the cooling system), flight controllers in Mission Control took action to help keep the crew safe. You can see this if you look at the ETHOS display again. The “coolant temperature” in the Harmony Node is very high (>33 degrees C as I write this). This is because flight controllers shut down the cooling loop, which would slow down a leak (if there were one). Without cooling, the temperature started rising! You can also see this by going to Page 2 of the ETHOS displays (which, conveniently, also has a simple diagram of how the cooling system works inside the ISS). Look at the temperatures of the cooling loops – see how the temperature in the Lab is low, but the temperature in Harmony is high? The Lab temperature is normal. As the flight controllers in Mission Control get the Space Station back to normal, you’ll see the temperature in Harmony come back down – fast! Also look for the cabin fan in Harmony to come back on. At this point, most of the high drama is over and it sounds like the crew will safely return to the rest of the Space Station soon. You can keep watching ISS Live! throughout the evening, looking for signs that life is getting back to normal in orbit. For now, I hope you enjoyed taking a look at a flight controller’s point of view! Next Geologists and Engineers Head North to Find… Ice! Thank you! I’ve updated the link.